SAILAUF, Germany, Sept. 14, 2018 (GLOBE NEWSWIRE) -- Cities around the world increasingly recognize the significance of autonomy, electrification and mobility services to the future of how people live, work and move around in urban centers. As part of Magna’s commitment to helping shape future mobility, the company announced today it will join BMW i Andretti Motorsport as a primary partner for their Formula E team. The ABB FIA Formula E Championship, the only racing series to use all-electric vehicles, takes technology to the streets in cities around the world, some of which are facing complex mobility challenges. 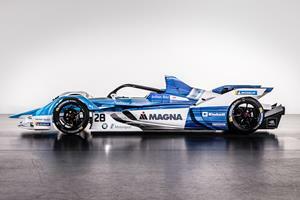 The collaboration with BMW i Andretti Motorsport demonstrates Magna’s commitment to making a positive social and environmental impact, from electric and autonomous vehicles to smart cities. Magna’s involvement in Formula E marks the most significant engagement with a motorsports team in the company’s history. The rationale is simple – it serves as a real-world opportunity to make a difference. Formula E provides a powerful platform to advance Magna’s engagement with startups, city leaders, universities and consumers in city centers. In conjunction with the race schedule, Magna will engage with a broad range of leaders about each city’s specific mobility challenges. Paired with existing research, these first-hand conversations will inform future development and collaboration on mobility solutions. Season 5 begins with a race in Saudi Arabia on December 15, 2018, and runs through July 2019 with stops in Hong Kong, Paris and New York City, among other locations around the world. Stay up-to-date on the team’s drivers, schedules, and race season by visiting magna.com/formulae. We have more than 173,000 entrepreneurial-minded employees dedicated to delivering mobility solutions. We are a mobility technology company and one of the world's largest automotive suppliers with 339 manufacturing operations and 93 product development, engineering and sales centres in 28 countries. Our competitive capabilities include body exteriors and structures, power and vision technologies, seating systems and complete vehicle solutions. Our common shares trade on the Toronto Stock Exchange (MG) and the New York Stock Exchange (MGA). For further information about Magna, visit www.magna.com.